Now in its third year (at least), Film Pop hosts a bike-in at the McAuslan Brewery terrace along the canal. You don’t need a bike to attend, but there’s something very satisfying about pedaling along the Lachine Canal’s beautiful bike path and joining the mass of people to watch an outdoor screening over a beer. Film Pop’s coordinator Ariel Esteban Cayer spoke to me about the event and why this year’s film is Brain De Palma’s 1974 horror classic The Phantom of the Paradise. I think the bike in came to us because of the location. The St. Ambroise terrace is near the canal and next to that beautiful biking path and so the idea was that you could bike in and have a beer and stay for the movie. It’s very much in this spirit of having people use their bikes to come to the screening and it’s most efficient and most enjoyable way to get there. There are similar screenings to this all over the world. Of course, people can come anyway they please, but the location is so bike friendly so we call it a bike-in. I love outdoor screenings. It has a special and fun atmosphere that we bring to it every year. We have DJs there all day. And it’s a brewery and there’s beer. All this creates this party atmosphere that carries on throughout the screening. We project over a big white truck every year. It’s casual and very relaxed. It’s less rigid than a theatre, and you’re outdoors. It all combines to make it special. It’s one of my all-time favorite films. It’s the 40th anniversary of the film and a new blu ray of it is coming out. It all kind of clicked that we should screen it for people not familiar with the film. It’s a ’70s cult object. People know Brian De Palma for Scarface, but personally, I think the mid -70s to mid-’80s is the most interesting with horror and genre films like Blowout and Dressed to Kill and Carrie. 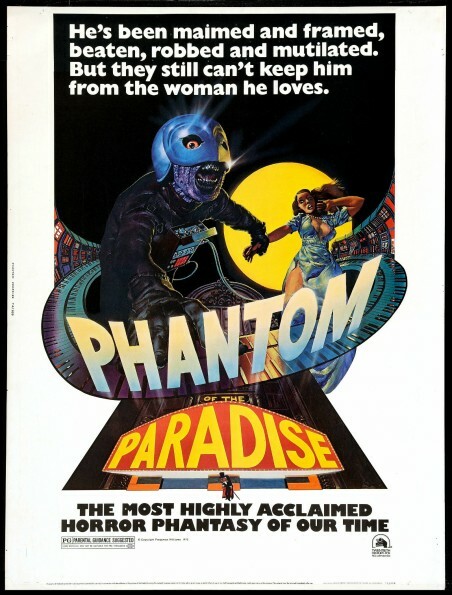 Phantom of the Paradise is maybe his crowning achievement. It’s a crazy movie in which he reconfigures the whole classic Phantom of the Opera story. It centers on a phantom haunting the Paradise, this big rock venue that an entrepreneur opens. A bunch of bands perform there every night and there are poppy, nostalgia bands and hard rock bands. The film makes use of elements of the Picture of Dorian Gray and Faust and De Palma takes all these things in a specific 1970s glam rock. It’s this crazy musical/horror film. It’s really great, such a time capsule, but an exaggerated one. The film has iconography that inspired bands. People will watch the film and recognize them. One band that performs in the film has make-up that is reminiscent of KISS. KISS debut’s album came out that same year. There’s a debate over who inspired who. It’s also a little known fact, but Phantom inspired Daft Punk to have helmets. Film Pop’s Phantom of the Paradise screens at Terrace St. Ambroise at the Brasserie McAuslan (5080 Saint-Ambroise) on August 16. The DJs and BBQ begin at 4:30 p.m. and the film screens at 9 p.m. Entrance is free and seating is provided. Arts this week features film screenings, talks and tons of great vernissages to see.